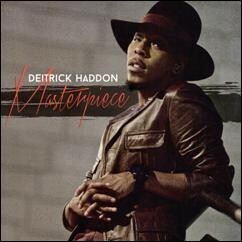 NASHVILLE, TN – Award-winning gospel superstar, songwriter and producer Deitrick Haddon takes his cutting edge style of music to new heights with his upcoming album Masterpiece, to be released on Friday November 6, 2015. Unveiling the album cover today, Haddon also launches the new album with a special pre-order available on iTunes now, where fans can get an exclusive bonus track that is available only by album pre-order. Featuring the lead single “Restore Me Again,” the prolific 3-time GRAMMY®-nominated, multiple Stellar and Dove Award-winning musician continues to bring a progressive sound to his music, with the single ascending through the Top 20 at Gospel radio – creating a contemplative and stirring mood backed by a guitar and percussion-driven hook. The highly-anticipated 16-track album showcases the always unexpected, hit-making force of Haddon’s wide-ranging talents with outstanding vocals and a unique style that have garnered him accolades as a gospel leader and music innovator. Filled with powerful songs such as “On The Way,” “Be Like Jesus,” “Perfect Storm,” “Under Control,” and “Masterpiece,” Haddon’s album includes rhythmic, riveting beats, fused with sounds of R&B, hip-hop and soul along with tinges of reggae, all perfectly woven together with restorative lyrics that inspire fans to believe and trust God’s plan in their lives. No matter what, through great times or times of hardships and doubts, everyone is a unique masterpiece through His design. Recorded in Los Angeles, the gospel superstar and television personality will soon also hit the road for the release of Masterpiece, including upcoming appearances in Dallas (September 30th), Philadelphia (October 15th), Washington DC (October 16th), the 46th Annual GMA Dove Awards (airing October 18th), and more. Deitrick Haddon is managed by Relevé Entertainment, LLC.